Writing about a new Tuba Skinny album presents a “Rolling Stones” problem. Everyone already knows about the band so there is nothing left to do but focus on the music. Fortunately, their tenth album, as unbelievable as this will sound, is their best. Obsessive followers of their Youtube videos will have heard them introduce all of these songs over the last few years. Their method is to rehearse on the street, fine tune in performance, and nail it in the studio. If you have a favorite Youtube clip of one of these tracks you owe it to yourself to check out the album version. The album itself was recorded a full year ago at The Living Room Studio in Algiers. That delay for post-production tells you something about their concern for getting everything right, and they did. The sound throughout is superb. Of 14 tracks two are originals. The title track “Some Kind-a-Shake” is Shaye Cohn‘s latest. While she’s only showed us a handful of compositions over the years, this one is ambitious on a new level. It’s a complex arrangement with some guitar rag elements and Ellingtonian art. That actually could be a statement for the album as a whole. Beautiful tunes with emotional depth, and a little ruckus thrown in where it’s needed. The other original is Ewan Bleach‘s “Berlin Rag”. His composition also appears on a Frog and Henry album with which he was involved. I love that we now can compare two interpretations of a modern original. They are as different as night and day and both beautiful. I wish more bands felt comfortable covering each other’s new work. Some Kind-a-Shake by Tuba Skinny Ewan Bleach lives in the UK where he is involved in a number of fantastic bands, he has also been spotted many times with Tuba Skinny on the streets of New Orleans. He previously appeared on four tracks of their 2012 Rag Band album but hasn’t joined them in the studio again until now. The addition of Bleach’s alto throughout and his clarinet on two tracks (while Craig Flory, on clarinet for the rest of the album, picks up the sax) is one of the things that brings this album to a new level. It’s a big group at this point, nine instrumentalists and Erica Lewis contributing vocals on three tracks, but Shaye Cohn knows how to highlight subgroups within the lineup and they are as always star ensemble players. The compelling arrangements and focus on early New Orleans style ensemble playing is the thing that stands out about the band to the most tuned in of their fans. That they have created a global following without a focus on soloists is a remarkable achievement, and a throwback few could have predicted. They solo, of course, especially on the street where people are more likely to be sitting in, but solos aren’t the heart of what they are doing. This comes through especially clear on this album. Several of the best titles are softer numbers which are often harder to pull off. “Echo in the Dark” is an unassuming 1937 track from The St. Louis Crackerjacks. The Tuba Skinny arrangement brings out every bit of potential and makes it transcendent. Their “Saturday Night Function” slows down the already slow Ellington’s Cotton Club version while changing up the steady beat so prominent in the original. King Oliver’s “Stealing Love” is ghostly beauty in its original and in Tuba Skinny’s simple-yet-more presentation. There are some wow moments. “Thriller Rag” is a revival standard, played by New Orleans old timers like Bunk Johnson, UK Trad Jazz stars like Chris Barber and Ken Coyler, and European transplants to New Orleans like Papa Bue. Tuba Skinny has also made it a standard part of their repertoire and there are dozens of videos of them playing it. Their album version is a crisp romp in the style that is their own. Erica Lewis joins the band on three bluesy vocal numbers. Fats Waller’s “Squeeze Me” provides a sultry break six tracks in. The laidback arrangement puts the band in full support mode, highlighting a voice many have been missing. “I’m Going Back Home” is the Memphis Minnie and Kansas Joe McCoy duet, not the Nina Simone song. Lewis is joined by Greg Sherman who has grown into a unique rag blues vocalist. 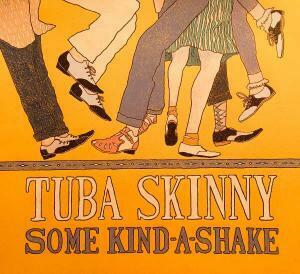 Some Kind-a-Shake by Tuba Skinny Tuba Skinny brings a jazz glow to their blues tracks that distinguish them from the many string bands covering similar material. The wide instrumentation drawn on is key. Sherman provides a stellar vocal to Blind Blake’s 1927 “You Gonna Quit Me”, an album highlight, but the band could be playing without a vocalist and what was a simple country blues would still be jazz gold. Some Kind-a-Shake by Tuba Skinny The show stopping, and album closing, “Wee Midnight Hours” Brings Lewis and Sherman together again to channel Blind Willie McTell and Curley Weaver. Even for Tuba Skinny, their performances of this tune have become sensations. For good reason. From the matched vocals to the musicianship to the production it is near perfect. Buy Tuba Skinny albums as downloads from their Bandcamp Page, or from their exclusive vendor for physical CDs and LPs, The Louisiana Music Factory.